Dry bulk handling in the port of Chicago is among the most sensitive in the country. Winds from Lake Michigan create difficult conditions for port operators during the loading and unloading of bulk materials such as iron ore and manganese. In an effort to mitigate the hazards posed by fugitive dust emissions from certain materials, the City of Chicago has introduced some of the strictest regulations for bulk material storage and handling of any city in the nation. Part of this regulation requires port operators to take comprehensive action to mitigate the environmental impact of the dry bulk handling activities and protect workers from fugitive dust emissions and particulate matter (PM) exposure. A Fugitive Dust Control Plan must be designed and produced ahead of any operation involving hazardous dry bulk materials. Manganese is a naturally occurring element primarily used in the production of steel. Although very small amounts are found naturally in the soil, inhaling large of amount of manganese – which can also be flammable – is extremely hazardous. Anytime this material is handled at a Chicago port, site managers must combine a number of different measures to formulate and implement a site-specific plan. A recent offload of manganese was especially challenging for one local port company who contracted 5R Enterprises to operate a mobile HKD Blue V-500GT for their dust suppression. A half dozen 20’ shipping containers were stacked perpendicular to the barge holding the manganese. The man-made wind barrier would trap the manganese emissions kicked up by the wind but was only part of the solution. 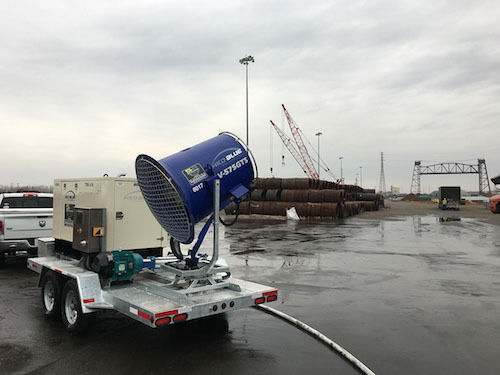 The team ultimately relied on an HKD Blue V-500 GT unit to create a “wall of water” downwind of the natural man-made barrier. Any manganese dust not trapped by the barrier was immediately blanketed by the atomized mist launched from HKD’s machines, and site workers were able to unload the material safely and on schedule. HKD Blue’s Variable Flow GEYSER Nozzle is different than typical water atomizing cannons because it can control the water flow to reduce runoff. The unit can be controlled remotely by site managers, and mobile units like the V-500T can be positioned for specific offloads but our machines can also be installed as part of permanent fugitive dust control solution for your terminal location. HKD Blue machines are easily fitted atop 20’ steel towers for fixed dust emissions locations at ports. Water throw trajectory, angle, and particle size are all controlled remotely and multiple fan towers can be networked to provide a dynamic layer of emissions control in unison. Local regulations and conditions require a unique solution for any port terminal and traditional water-based dust control strategies are often ineffective and waste valuable site resources. 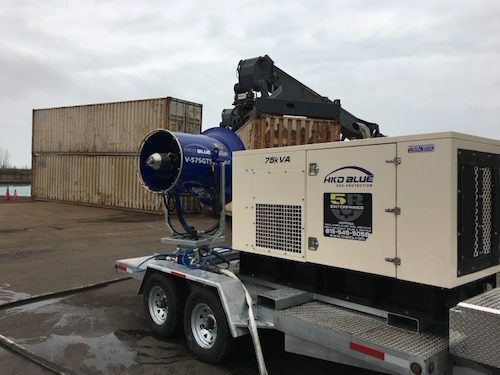 Developed from HKD Blue’s industry-leading snowmaking technology, the company’s industrial grade dust control machines are trusted by dry bulk handlers and demolition teams across the United States and Canada. HKD Blue works with its partners to identify site-specific challenges and design custom dust control plans that rely on their high-quality machines. Whether it is a manganese offload or a major highway demolition, HKD Blue has a solution that will fit their client’s needs.